A team of students from Hixson High School has earned a spot in the Top 50 of the nationwide VanCustom Culture competition. A panel of judges selected their work from a submission pool of 500 entries to continue to the public voting phase and a chance to win $75,000 for their art program. The entry itself is two pairs of Vans shoes. 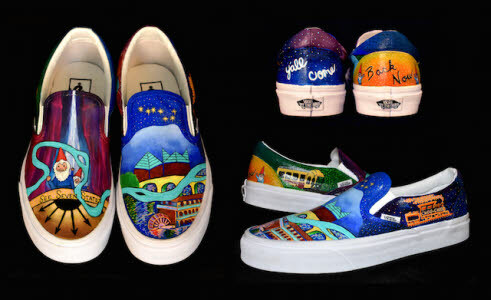 Vans sends out shoes to all the participants, requesting them to create designs fitting two separate prompts. This year’s themes are “Local Flavor” and “Off the Wall”. For Local Flavor, the Hixson High students decided to highlight iconic sights and symbols of the Greater Chattanooga area. These shoes represent Ruby Falls, Rock City, the Incline Railway, the Choo Choo, Point Park, and cultural icons like the Delta Queen and the Cherokee water spider. The Tennessee River can also be seen coursing over both shoes, bringing them together. In the Off the Wall design, students built platforms to create a cavern underneath. The cave is lit by fairy lights, making the cast resin crystals gleam. Mushrooms dot the subterranean landscape, and a monster defends his treasures. Moss encircles the trim of the shoes, providing a smooth transition from top to bottom. 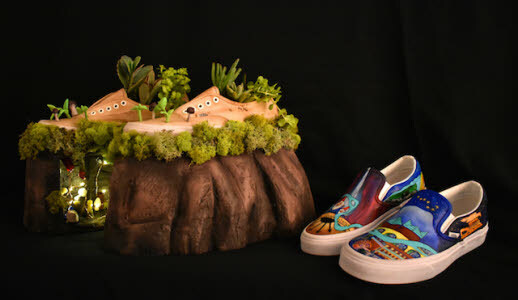 Living plants are placed inside the shoes, while artificial sprouts pop up near the toe. Voting opens on April 23 and closes on May 4. Individuals can vote once per day at customculture.vans.com. The team at Hixson appreciates the readers’ support, whether through votes or sharing their story.